Eva Yerbabuena after dancing Flamenco, done (I love this technique) with me now famous palette knife! not as hard as it looks, i promise! only hard if you are not "flexible" with the result, as it will probably we quite different from what you had planned! try it some time, it is so much fun!! It is my 50th picture here!! it is been a PLEASURE to share these 50 pics with you, guys! thanks so much for all your comments during this time! Yeah, #50, it's increasing so fast, haha!... And, yes, fast, but it's always with So Much Quality!! Love this style, with palette knife! The bg. in blue is great, too! Congrats, Aliciaaa!!! ufff just imagine this kind of site with video/skype chats! that would be a great way to practice! we´d spend all day here! i would if i could! maybe i have already started to roll! i m meeting this evening the president and vicepresindent of a big Flamenco society to speak about potential colaborations! i´ll tell u how it goes! 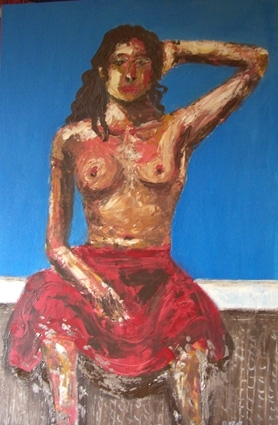 maybe they´ll offer me an exhibition of Flamenco paintings around the world i´ll make sure we go to Brazil! Hey, dear friend, no hurry, no worry!... Great weekend 4 u, 2!! hi! i just got busier and busier! my boss is killing me! oh well i hope to be back on track soon! back again! at least for today!! hav a great weekend! i m sending you soon images of the super snowfall in Barcelona last week! Thank u, Alicia, just saw it, really impressive & beautiful photos!... Have a great weekend, too, dear friend! i m glad u like them!! thanks!! it is also interesting to do, lots of fun! great and surprising textures, but a little bit out of control! Happy 50th! What a wonderful way to celebrate!!!! i will drink a healthy cup of herbal tea to your success my friend! thanks!! i have to celebrate myself too, i didn´t think about it! for this success i must acknowledge my dear friends for their care and support, specially you!! don´t worry i try to do it only during my breaks! you see, now that i m alone i am fine doing that! the only thing is that i should leave soon too! as long as your work does not get neglected... did you manage to go snowboarding? yes we did! big sun on saturday, fondue at night (lots of cheese), lots of snow and traffic jam of sunday (6 h instead of 2 h to come back home) and raclette at night (more cheese...that is what you get when you have a french boyfriend) lucky i do lots of mountaneering, otherwise i´d get super fat! oh raclette, had lots of that in Switzerland, together with cheese fondue... life is not fair, i would burst too if i had too much of the good stuff... KaBOOM! once we did freeride snowboard after a heavy fondue..Fabien´s uncle took us up the hill by car, and the idea was to slide down the hill on the snowboard…but the snow was so soft that I got stuck! It was dark at night, I was buried in the snow up to the hips, and stuff with fondue! nothing to worry, as u can see i survived! but i don´t recommend it for a good digestion! i can see these funny pictures in my mind! i m sure you can also see how cold it was! i m so happy you like it!! thanks i really appreciate! not much red here though! thanksa lot! have a good week-end too ! Wow! Very beautiful portrait. Very nice! thanks! i m happy you like it!